"Game of Thrones" fans watched in horror as last night's episode brought one of the most shocking twists the series has seen so far. The episode is titled "The Rains of Castamere," but the part everyone is talking about is the Red Wedding. Robb Stark and his mother, Catelyn, are at the Twins for the wedding of his uncle Edmure Tully to one of the daughters of Walder Frey. This marriage is a consolation prize of sorts -- Robb was supposed to marry one of Lord Frey's daughters, but broke his word and married Talisa instead. The wedding itself went off without a hitch, and everything seemed fine when the bride and groom were whisked off for their bedding ceremony. Then, the doors to the hall close, the musicians begin playing the Lannister anthem "The Rains of Castamere" and the bloodbath begins. First to die is Robb Stark's pregnant wife, who is stabbed in the stomach repeatedly. Then a bevy of crossbow-bearing men appear in the balconies and begin firing on everyone below, including Robb and his mother. 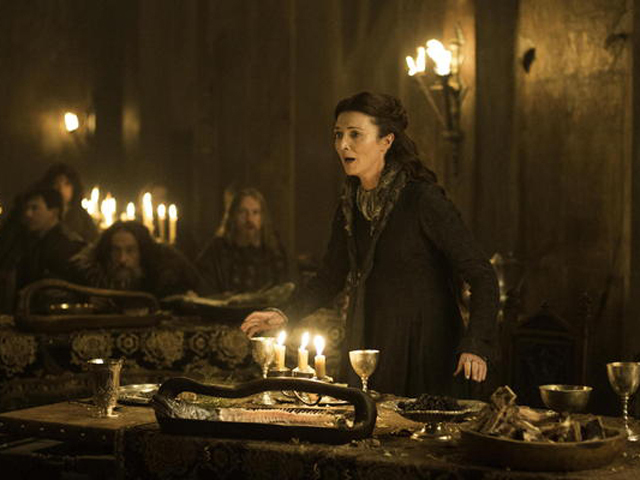 In a desperate attempt to save her son, Catelyn grabs Frey's wife and threatens to cut her throat. "I'll find another," he replies, nonchalantly. Then, as Catelyn watches, Lord Roose Bolton stabs Robb through the heart, whispering, "The Lannisters send their regards." Catelyn, screaming in rage and despair, cuts the throat of the young girl she was holding hostage. Then, after watching her eldest son die, her own throat is cut. Just barely escaping this carnage is Arya Stark, who was brought to the Twins by The Hound in hopes of trading her to her family for a reward. She made it out alive (the two, disguised as hog farmers, were turned away from the "celebration"), but now two more members of her family are dead. The repercussions of this bloody, brutal episode will play out next week in the "Game of Thrones" season 3 finale. Tell us: What did you think of this shocking turn of events, "Game of Thrones" fans?